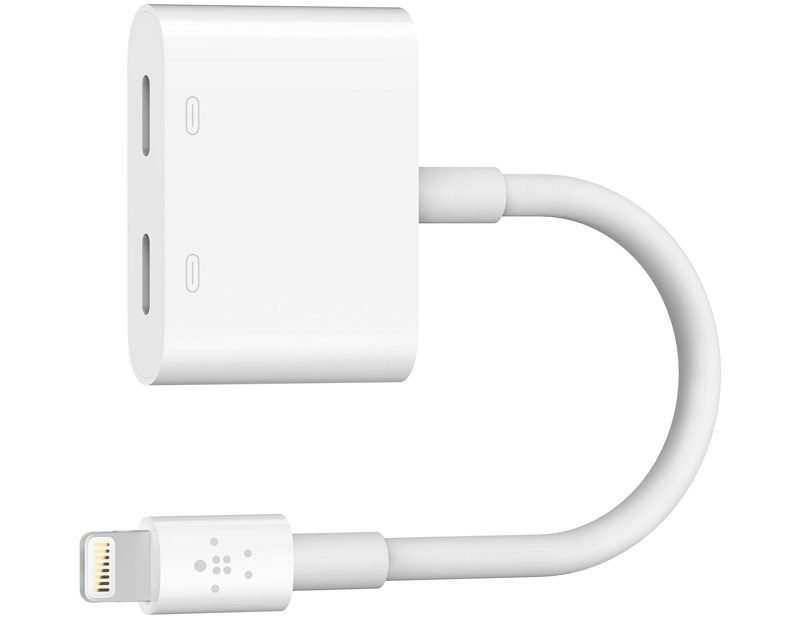 According to Belkin, the Lightning Audio + Charge RockStar was developed "closely" with Apple, and it does indeed resemble Apple's own iOS adapter accessories. The Lightning connector on the end of the RockStar plugs into the iPhone for passthrough charging (up to 12W), while additional Lightning ports on the device accommodate either the Lightning-based EarPods or headphones with a 3.5mm jack using Apple's 3.5mm to Lightning adapter (included with the iPhone 7). "We're excited to offer the Lightning Audio + Charge RockStar to our customers, extending our family of RockStar multi-port products and creating an easy way for people to charge and listen on the go," says Steve Malony, VP, GM Belkin. Belkin's Lightning Audio + Charge RockStar doesn't seem to be a perfect solution to the charging while listening issue. The Lightning end needs to be plugged into the iPhone, while a Lighting cable needs to be plugged into one port for charging and Lightning headphones (or headphones with an adapter) need to be plugged into the other port, resulting in a mess of cables. Adding in the 3.5mm to Lightning adapter makes the situation even worse, with a total of two adapters and a Lightning cord plugged into the iPhone. The Lightning Audio + Charge Rockstar supports 48 kHz 24-bit audio output and it's able to work with a variety of cases, including the iPhone 7 Smart Battery Case. It is Made for iPhone certified. Belkin plans to start selling the Lightning Audio + Charge Rockstar on October 10 for $39.95. It will be available from the Belkin website, the Apple online store, and Apple retail stores. I thought we were supposed to avoid this . . .
Good, now I can jump rope down the street. "If you see a dongle, 'they blew it'." The Apple EcoSystem -- Land of 1000 adapters. A bulky adapter for something that was not needed for the past iPhones. What innovations can Apple think of next? People need to calm down about the audio jack removal. I mean, who is really crazy... the one who removed an ancient connector from their modern pocket computer, or the one who bought analog headphones for $350 now screaming and shoking... jeez.